Surprise Singing Chef, Marco and the Irish Singing Waiters, available in Ireland to WOW your guests! Singers for Hire Ireland’s number one boutique entertainment agency are ready and waiting to transform your wedding or event into a celebration. Our singing waiters are perfect for weddings, corporate events, conference entertainment or team building workshops; in fact any seated dinner situation. We are delighted to bring our unique style and quality of entertainment to your guests with prices which are fully inclusive of travel and professional sound. 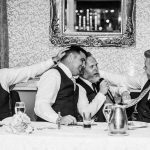 With our Irish Singing Waiters Wedding Entertainment smiles and laughter are guaranteed! A sudden commotion as a waiter drops a tray? An announcement about a lost phone? A request to move a badly parked car? Maybe the waiter is about to sing! 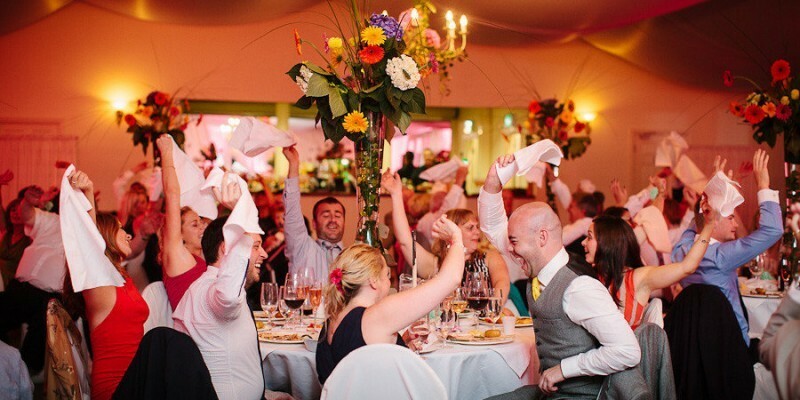 For over 15 years our Irish singing waiters have been beguiling and entertaining wedding guests around Ireland. Our Irish singers have sung in every province. We have surprised guests in all the leading Irish wedding venues. Whether you are celebrating in a castle in Tipperary or Kilkenny on the beach in Wexford or Wicklow, in an exclusive retreat in Louth or Meath or a world renowned golf resort in Limerick or Clare, Singers for Hire have your entertainment covered. Singers for Hire have put a unique Irish wedding spin on the singing waiter format. We have whipped up a secret recipe that is guaranteed to surprise and entertain your friends and family. Our competitors are playing catch up because we are always innovating and producing new and exciting routines. New surprise acts to amuse your friends and family. Don’t be fooled by the rest, be fooled by the best; the one and only Singers for Hire, Irish Singing Waiters. If you are out for dinner and you hear an unexpected announcement, or the manager is flirting outrageously with the bridesmaids ask yourself, “are the Irish Singing Waiters here?” If they are, you know that they are about to kick off a fantastic and fun party. Our Irish Singing Waiters have perfected the art of undercover entertainment. If they weren’t Secret Singers they could be secret agents. Don’t ever assume that the boring talk about wine by the sommelier will stay boring for long. That wine expert might suddenly burst into song. Remember that the anticipation that he or she might sing is all part of the fun. Can you imagine your invitees’ reaction as the waiter serenades the bridesmaids in Italian? Next he croons to the best man to the strains of “I Will Survive”. And all this is just the overture as soon the whole room are up in a conga while singing “Show me the Way to Amarillo” and swaying to the tune of “Que Sera Sera”. Our pricing is clear and fully inclusive. The cost of our packages is not budget busting. Singers for Hire offer discounts for off season and midweek celebrations. We will tell you the full cost of the Singing waiters entertainment before you book. Therefore the only surprise you get is the one you expected. The Irish Singing waiters will provide all the sound equipment required. All our equipment is top professional standard and every event is sound checked before you arrive. As we want to ensure a seamless and stress free event for you our staff will liaise with your venue before the event. We are proud to offer you the very best singing wedding entertainers money can book. Hiding in plain sight until the moment they amaze and wow you and your guests. Turn an ordinary dinner into an extraordinary banquet with Singers for Hire Irish Singing Waiters. thank you so so much for yesterday. My Dad went from saying 'they've some cheek trying to flog wine' to being in stitches of laughter !!! It totally made the day for everybody. I just can't thank you enough. You're utterly amazing. “Astonishing, classy, hilarious and fantastic” are just a few of the words used to describe Ireland’s top entertainer Marco the Opera & Swinging Chef and his Singing Waiters. The perfect entertainment solution; Opera aficionados and Rat Pack fans will be bowled over when these artists in disguise burst into song.